Barney's new park is a great place to play! And it's a great place to sing and dance with the world's most musical dinosaur. The pond is a great place to sing "Duckies Do," and the playground is perfect for singing "A Swing Is A Beautiful Thing." There are plenty of places to create musical memories with Barney, including the gazebo and a fun caboose. 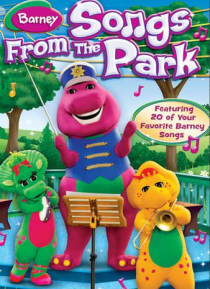 So tune up and tune in for a musical tour of B… arney's park - it's something to sing about!